Is there any switching solution Radial hasn't thought of yet? Apparently so, as the company's new 4-Play direct box is aimed at musicians who play multiple instruments on stage. The unit comprises a standard 1/4" input, which feeds four balanced XLR outputs. The input can be muted via a footswitch for silent instrument swaps, while a select footswitch cycles between the four outputs. Each of the outputs has a ground lift switch, while a dedicated tuner out is also included. 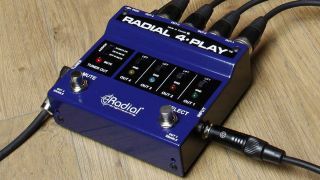 Radial's 4-Play is available now for $279. Head over to Radial for more.